The Reinauer Transportation Companies of New York have continued to expand their fleet for many years at the Senesco Marine yard in Rhode Island. Reinauer introduced the Ruth-class in 2008, and the slightly shorter and narrower B. Franklin-class in 2012. The most recent addition to the Reinauer fleet, the Dylan Cooper, was successfully launched at Senesco in early June 2015. The Dylan Cooper is a B. Franklin-class tug designed to work with Reinauer’s 60,000 and 80,000 barrel JAK-equipped barges. 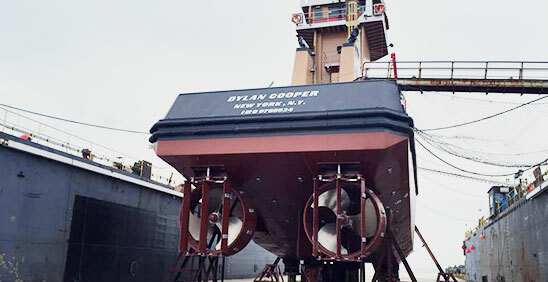 The Dylan Cooper is the fifth Reinauer ATB equipped with Nautican Integrated Propulsion Units. Although it was previously thought that nozzles might not work well for ATB applications, the Reinauer vessels have conclusively shown the opposite to be true. The Nautican units offer proven performance gains, allowing for high speed and powerful towing capabilities, while the triple rudder system offers excellent maneuverability; a perfect combination for ATB operations. Nautican worked with Reinauer and Bob Hill of Ocean Tug & Barge to incorporate the Integrated Propulsion Units (IPUs) into their design. The first Nautican system was installed on the Ruth M. Reinauer in 2008. Based on the Ruth M. Reinauer’s performance, Reinauer decided to continue to install Nautican nozzles and propulsion units on both their Ruth and B. Franklin-class tugs. Industry demand for the Nautican units for this type of application continues to grow, as more vessel owners are choosing to add nozzles and integrated propulsion units to their ATB fleets. Reinauer’s next vessel with Nautican units is currently under construction at the Senesco yard with an expected deliver in early 2016.